Preheat oven to 400°F. Lay the bacon on a sheet pan and bake until crisp (15-20 minutes). Drain on paper towels until cool; crumble and set aside. In a medium-size bowl, stir together the cheddar cheese, mayonnaise, pimento and cayenne pepper. Divide the mixture among the 8 slices of bread, pressing to adhere. Sprinkle 4 slices with the crumbled bacon. Place flour in a shallow container. Combine buttermilk and egg in a shallow, medium-size bowl until blended. Season breadcrumbs with salt and pepper and spread over the bottom of a third shallow container. Heat the oil in a large, non-stick skillet over medium-high heat. Dip tomato slices in flour, then in the egg mixture, then into the breadcrumbs. Fry until lightly browned (about 3 minutes per side). 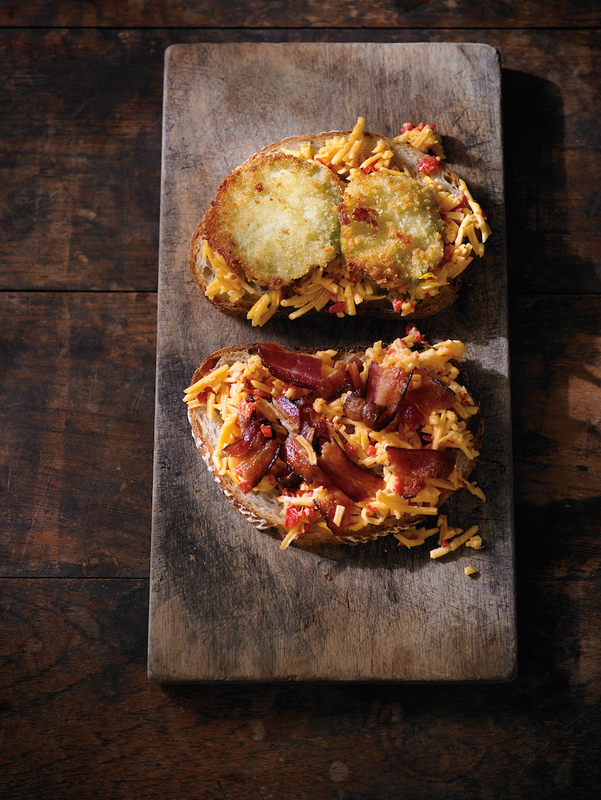 Lay one fried-tomato slice on top of each of the four slices of bread with crumbled bacon. Cover with the other four slices of bread, cheddar-side down, and press together. Butter one outside surface of each of the four sandwiches. Using the same skillet, add two sandwiches, butter side down, and cook until bread is toasted (about 3 minutes). Butter remaining side of each sandwich; flip and cook 3 minutes more, or until cheddar cheese is melted and the sandwiches are nicely browned. Repeat with remaining sandwiches and serve immediately.